Weighty Matters: Is This New Product Healthy? Whole grains are the first ingredient. Sugars (different types) are the 2nd, 3rd, 5th, 6th and 7th ingredients (they total about 4 teaspoons) and make up slightly less than 50% of carbohydrates. Hopefully readers of my blog know that my post title question is rhetorical. 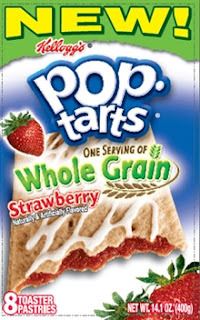 Putting whole grains into a pop tart doesn't make it healthy, it makes it just slightly less unhealthy than a regular pop tart. Of course if I were Kellogg's I'd shrink the size of my bar by 20 percent, call them Pop Tart Breakfast Bars and apply for a Health Check because this product, aside from it's size, meets all of the new Health Check criteria for filled or coated grain-based bars.